The iPad 3 rumor mill has been picking up steam in recent months, and with the anticipated release of Apple’s next-generation tablet not far away here’s your essential guide on what to expect come launch day. There were rumblings that Apple may launch a smaller 7-inch tablet to compete with low-cost competitors like the Amazon Kindle Fire. Rumors of an iPad “mini” have largely subsided, with analysts largely dismissing any likelihood of an iPad mini launching alongside the iPad 3 in 2012, which is expected to be essentially unchanged in size. There have been few clues as to the exterior design of the iPad 3, with some early reports suggesting that the iPad 3 would be thicker than the current model (by 0.7mm) to accommodate a more advanced back-lighting system. There has been a lot of speculation surrounding the iPad 3’s display, with disagreement about the primary manufacturer but general consensus that the panel will support “retina” level resolutions. Initial reports pointed towards Sharp as the panel supplier, with the company’s new Indium Gallium Zinc Oxide (IGZO) touted to replace the current technology. There’s been ‘leaked’ images of what is allegedly the iPad 3’s IGZO display, but more recent reports have suggested that Sharp has been dropped due to failure to meet Apple’s standards, with Samsung and LG instead likely to produce high-definition (2048 x 1536) 9.7 inch QXGA displays for the iPad 3. The panels are apparently high-definition (2048 x 1536) 9.7-inch QXGA displays, manufactured by Sharp and LG. Several weeks ago Bloomberg offered up a report that asserted the iPad 3 would feature 4G LTE capability and an A6 quad-core processor. A recent debug report from a purported iPad 3 prototype also claimed a quad-core processor and 4G LTE, but analysts are split over the issue of 4G with many claiming that Apple will not push a new technology that the international market isn’t ready for. Battery life is a big issue with any tablet, and there have been indications that the iPad 3 battery will be both thinner and lighter as well as offering extended battery life. Details about the iPad 3 camera(s) have been thin on the ground, but a report out of iLounge claimed that the iPad 3 would feature beefed-up front and rear-facing cameras. The front camera will apparently be able to support HD resolution video, while the rear camera will have quality comparable to the camera on the iPhone 4S. 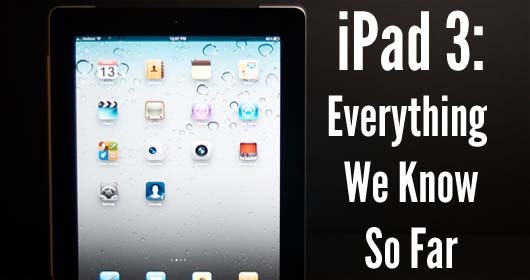 The iPad 3 launch date has been a constant source of speculation, with most observers and analysts agreeing that a March launch makes the most sense. It has also been rumored that Apple may launch the iPad 3 early, on February 24th – Steve Jobs birthday – to commemorate the life of the company’s late CEO. Other analysts have also suggested a late February release date. For what it’s worth, Japanese blog Macotakara recently claimed that the iPad 3 is on-schedule for a March launch.